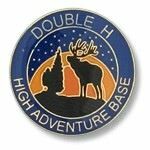 Philmonts Double H High Adventure Base is a cooperative effort between Philmont and the Rocky Mountain Elk Foundation. The 100,000 acre parcel of land is owned by the RMEF. They have been mandated to use the land for youth adventures and, in 2004, began a three year trial with Philmont to expand their high adventure program over to this land parcel. In my conversations with the Double H director at Philmont, I was told that there is currently no indication that the RMEF intends to end this arrangement at the end of the 2006 season. Most hits on Google that deal with Double H are merely mentions of the opportunity on various BSA Council and Troop websites. The following are among the most informative sites I located earlier this year (2005). I would expect that, following the 2005 summer season, there would be several more accounts and bulletin board postings available online. For a highly detailed account of what a group might expect, Id strongly recommend scanning or reading through the 80 pages (big font, lots of pictures) that a leader developed. THIS IS THE BEST INFO AVAILABLE!! Another comparison to the traditional Philmont trek by a seasoned Philmont adult trekker. IMHO, Seldons Philmont pages are THE internet authority on Philmont web resources! Our own trip was a fantastic learning experience. Having spent the last 3 days updating our other webpages, I dont have the time to update this page with our own tidbits but would be happy to tell you about it over the phone and could be more specific as to your questions. We took a challenging Class 3 trip with 5 youth (one female) and two adults approaching 50 years old. Im glad we did our homework before going but I surely have a few tips to share that would have made us even better prepared and packing lighter packs.